Deputy Attorney General Rod Rosenstein will not appear in front of the House Judiciary Committee on Thursday to discuss reports that he wanted to secretly record President Trump and then use the recordings to remove him from office under the 25th Amendment, reports the Daily Caller's Chuck Ross, citing an anonymous House Judiciary Committee aide, and later confirmed by CNN. 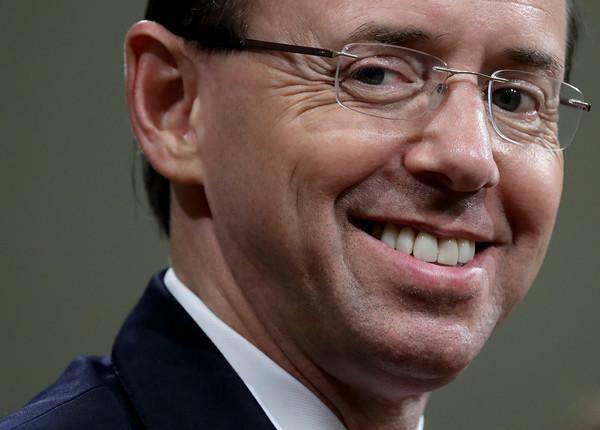 Rosenstein said he was joking when he made the comments to former FBI Deputy Director Andrew McCabe and FBI attorney Lisa Page, however that claim has been refuted by the FBI's former top attorney. "We have many questions for Deputy Attorney General Rosenstein and expect answers to those questions. There is not at this time a confirmed date for a potential meeting," the aide told the Caller. "Don’t think he is coming," added one Republican lawmaker on Wednesday. On Tuesday we reported that the FBI's former top attorney, James Baker, told Congressional investigators last week that Rosenstein wasn't joking about taping Trump. "As far as Baker was concerned, this was a real plan being discussed," reports The Hill's John Solomon, citing a confidential source. "It was no laughing matter for the FBI," the source added. Solomon points out that Rosenstein's comments happened right around the time former FBI Director James Comey was fired. McCabe, Baker's boss, was fired after the DOJ discovered that he had leaked self-serving information to the press and then lied to investigators about it. Baker, meanwhile, was central to the surveillance apparatus within the FBI during the counterintelligence operation on then-candidate Trump. Baker also is at the heart of surveillance abuse accusations, many from congressional Republicans. His deposition lays the groundwork for a planned closed-door House GOP interview with Rosenstein later this week. Meanwhile, the New York Times noted that McCabe's own memos attest to Rosenstein's intentions to record Trump - which led to Rosenstein reportedly tendering a verbal resignation to White House chief of staff John Kelly.